|In Faith In Action, Blog, Who is My Neighbor? I grew up in a great neighborhood. 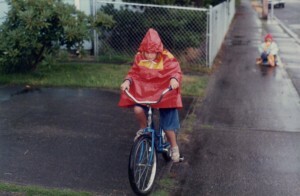 We had a big back yard, a park at the end of the street, a nearby 7-11 to fulfill our chewing gum and soda needs, and lots of other kids to ride bikes, hold fashion shows, and rollerblade around the neighborhood with my sister and me. 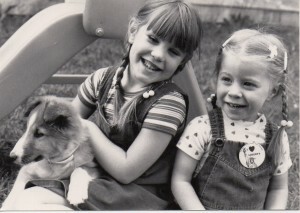 My big sister and me at 5 and 2 years old, with our brand new puppy we got at the Veteran’s Day parade. He would go on to wear many hats and costumes and pull many kids on skates up and down the block. We knew our neighbors, especially the older ones. We knocked on their doors and sold them chocolates, wrapping paper, and our own watercolors for a dime apiece. We came in for a snack when invited by the people mom and dad said it was ok to visit. We hung May Day bouquets on their door knobs, left Easter baskets on the front steps, and sang loud Christmas Carols with a group of friends, well into my high school years. Come to think of it, our neighbors were very patient with us. I never stopped to wonder why we knew everyone. We just did. When I recently asked my mom how they did it, how they laid the groundwork for a fun, safe neighborhood, she says it was mostly because of us, because of all the kids. “You guys were everywhere!” … it was pretty hard to ignore the regular parade of kids up and down the block. But I’m certain there was more to it than my mom remembers or is letting on. At some point, my dad must have crossed the street to introduce himself to the new neighbor and ask about his truck. My mom must have stopped in the middle of unloading groceries to talk to one of the white-haired widowers walking his dog, even though she was tired from work and rushed to get dinner. But when and how did that happen? When did my parents find the time? How did they decide who was ok to talk to and let their children visit? Now that my husband and I are raising our own daughter, it’s becoming more and more important to me to figure this all out: Where do I even start to build a casual, safe neighborhood community for my child? We live in an apartment right now, so it’s doubly difficult. We don’t have a lawn to work or play in or a fence to lean on. There are no other kids in our building to visit. Besides the odd stairway conversation, we shut our doors and live our lives inside. But there are neighbors. We are on different schedules, and there are often long periods of time between sightings, but there are neighbors. And, rather than waiting until we get the yard and the fence, I’m starting to think it’s time to knock on some doors. I want my daughter to have the same luxury I had of taking neighbors, not for granted, but as a given. I want her to know that neighbors are people you should already know and trust before the emergency happens, that neighbors are people who take notice of your comings and goings, who nod or wave as you pass by, who are welcome in your home for a visit and who return the invitation in their own time. I want my daughter to see this idea exploded into the rest of her life. Neighbors are people who take an active notice of each other on a grander scale, in your school, your work, and especially in your church. You share ideas, lend help and support and a voice when the other is lacking. You pray for them when you see the ambulance and hear about the disaster. You hope they will pray for you when they can, in their own time. I want these things for her, and that means I need to take the time to lay the groundwork. And it’s not as though I’ll be starting from nothing… our neighbor across the hall is 84 and tends the landscaping out front. The day after Thanksgiving, she hung a little Christmas treat for our daughter on the doorknob. We’ll start there, with a plate of cookies and a thank you note. And maybe some loud Christmas Carols in the stairway… I’ll let you all know how it goes.